Right off the bat, you'll likely notice that the Jeep Compass has a great design that is sleek and gives you plenty of space. This is made most effective due to the aerodynamic profile that lets you travel smoothly, without anything getting in your way. In particular, the sloped roofline of the car truly brings out its beauty, looking incredibly unique no matter which color you choose. 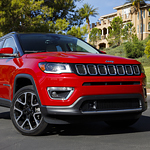 Want to take a Jeep Compass for a test drive? Stop by Allen Samuels at any time to do just that!